Just before the Easter holiday (timed to minimize attention from the press), Minister Nicholson signed the extradition order for Hassan Diab to be sent to France. Fortunately, Chris Cobb of the Ottawa Citizen covered this distressing news. Check it out. In response, I sent the following letter to the editor, which was published. Re: ‘We expected this decision, but not this way,’ April 6. I’ve followed the Hassan Diab case closely and am shocked that Minister Rob Nicholson signed the extradition order in the light of such flimsy, if not non-existent, evidence. Of particular concern to me is the fact that Diab has not been allowed to present evidence that clearly shows he is not the man they are after, particularly the fact that his palm and thumb prints do not match those taken from the crime scene. Even worse, it has come to light that Diab is only wanted for questioning. Let the French authorities come here and ask their questions. 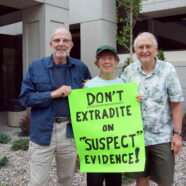 Canada does not extradite for questioning, only for trial.